Published in the UK by Fourth Estate today, the 7th of February 2019. A couple of years ago I read Karl Billinger's 1939 essay Hitler Is No Fool in which that author attempted to explain how easily a nation's people can be manipulated into acting against their own interests. 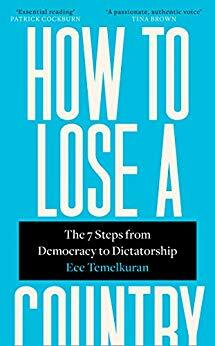 Temelkuran's How To Lose A Country shows that very little of the methodology has changed in the past eighty years. Indeed much of the British rhetoric I hear is nostalgic hankering for 'our glorious past', seemingly a want to return us all to an imagined version of that wartime society although, as Temelkuran repeatedly warns from her Turkish experience, we are highly likely to end up living as if we were on the Other Side. I found myself in agreement with all her observations and sadly recognising disturbingly similar versions of conversations I have had since 2016 with numerous people who, while incapable of actually defending or explaining their statements and viewpoints, nonetheless expect me to blindly agree because they can shout louder. All marketing and no substance used to be a joke, now apparently it's really the future. My dad pointed this out to me in the newspaper this week to see if I'd heard of it so it was fun to see you'd read it! It's scarily timely and will probably take the prize for most depressing read of the year! And this scenario is what keeps me up at night. I wonder what kind of world my grand children will face. Wow, this does sound like a disturbing read because of the similarities to the present. It's always scary when you read a book and you know it is true history and you can see the parallels to the modern world and current happenings around the globe. It's scary but I agree that it could happen with how things are going in the US/UK at the moment... chilling stuff! This book is absolutely terrifying, all the more so because obviously it is non-fiction. This sounds utterly terrifying. Every day in the US it feels like we're slipping further and further into an unbelievable reality, and the truly scary thing is that half the country is okay or even happy with it. The idea that we could slip so far so fast is painfully real.